Highly recommended by our Thursday night host Simon, we ventured to The Delaunay for a top notch English breakfast. Complete with eggs, bacon, sausage, tomato, black pudding, baked beans and mushroom. It was a delicious start to our Saturday and the perfect fuel before our adventure to Emirates Stadium for an Arsenal v. Swansea City match. Pre-match we planted ourselves at The Twelve Pins, a rather popular pub that was full of fans from both sides of the pitch. When the hour finally arrived we made the march through the surrounding neighborhood to the stadium with everyone else. It was a perfect day to watch some soccer. We enjoyed one more ale and something called a sausage roll that turned out to be way better than it looked before settling into our seats. The game was thrilling. We saw an outright red card, 6 goals scored, tried our best to learn what chants we could despite the accents and in the end Arsenal won. After the game it had started to rain and instead of wait outside in the mile long queue for the tube, we decided to hang out in a pub for a bit. Here we were befriended by a rowdy group of Swansea fans, who despite our red jerseys, were nothing but pleasant. Hammered, sure, but we were treated to a serenade and one of them even offered the Caravan in his driveway in Whales as refuge should Trump win the election. At the time everyone still thought it would never happen and now I'm kicking myself that I didn't get an email from that guy. After a quick trip home to freshen up and change we ventured into South Kensington proper to meet up with Simon again and a few of his friends. I couldn't tell you where we met them or where we went afterwards, but this is what I can tell you. Venture down mews. It's what they call some alleys and side streets (originally the service roads behind the grand houses of the Georgian and Victorian elites.) Many of these little neighborhood have pubs and it was at one of these mews pubs that we found our group for the evening and tucked into some fish and chips. It was at another one of these neighborhood pubs that we spotted this guy. It's Superman and he was very gracious and kindly agreed to let these tipsy and starstruck Americans capture this moment in a photo. And by starstruck, I mean only me. I was literally weak in the knees. Rob was the brave soul who walked up and very politely said hello and asked if it would be OK to take the photo. If I look a little funny, its mostly because Mr. Cavill is just as handsome in real life as he is up on the big screen and in real life it's actually worse because he is British. It's also probably because one of his friends was on the other side of the camera trying to tell me that if I asked, Mr. Cavill would take his shirt off. We did venture to one more bar after this but that was pretty much the icing on the cake that was this amazing day. We finally started to feel the effects of all of our adventures upon waking this morning but we rallied since it was our last full day in London. To appease my childish, "Bed Knobs and Broom Sticks" loving heart. We ventured to Portobello Road. The famous market wasn't actually open that day, but I didn't even care. We wandered past a few vendors, but really needed food and with the help of the trusty Google maps "see what's around" you function we managed to make our way to Daylesford, an organic farmshop and cafe. I could have lived in this place. Everything was farm fresh. There was produce, a butcher counter, a cheese counter, wine, beer, prepared foods, and everything else this little locavore could have wanted. Plus there's a cafe where you can eat food made with all of these incredible ingredients. They had bone broth tea for crying out loud. After this I had to swing by Topshop to pick up a leather jacket I had ordered the day before (I felt like such a local) and then we slowly made our way over to The Tower of London. Along the way we ran into a Diwali festival and stopped to admire the colors for a few minutes. And stopped at a pub to wait out a bit of rain. This is where we finally ordered a meat pie, and we should have started sooner. It was delicious! I'm not sure what I had imagined a meat pie would be like, but this was way better. 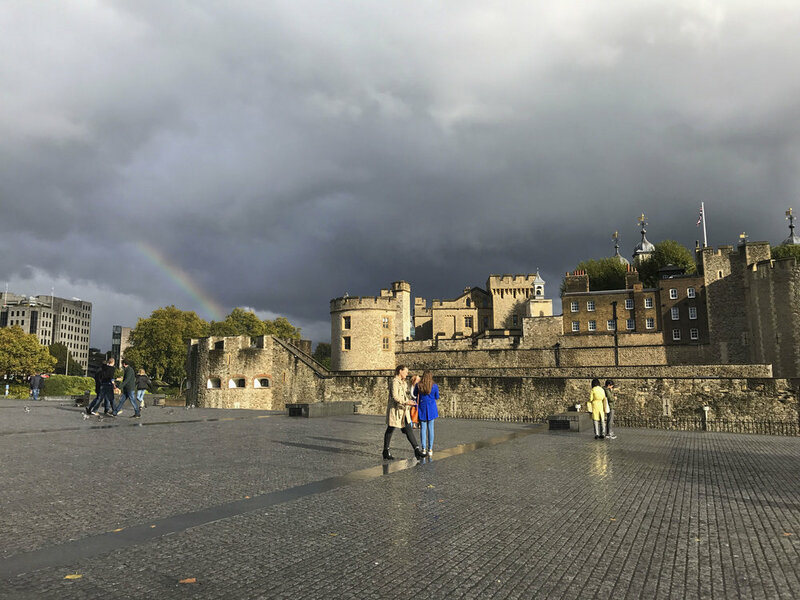 Once the rain finally let up we explored The Tower of London for a bit. My favorite parts were the crown jewels and the Ravens. Dinner that evening was to be our fanciest. Again at the suggestion of our new friend Simon we had made a reservation at Fera at Claridges. It's one of those pre fixe multi course deals. As Simon put it, it's an English chef making great food out of mostly English ingredients, meaning you can't get a lot more local. We splurged for the wine pairing too. I'd highly recommend this spot if you want to add a Michelan starred restaurant to your itinerary. We were pretty worn out and ready for our food coma after dinner. So we headed back to our flat the last time. When we left in the morning it would be to head to the train station and then on to Paris!